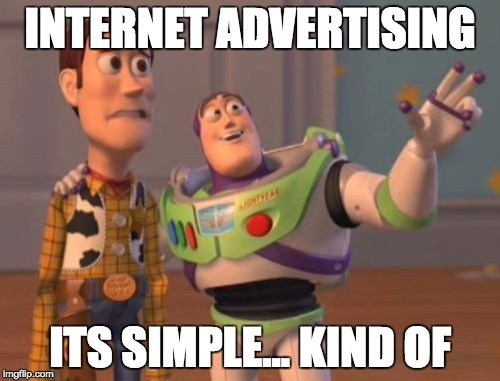 Most successful site owners and online publishers understand — in a general sense — how internet ads work. 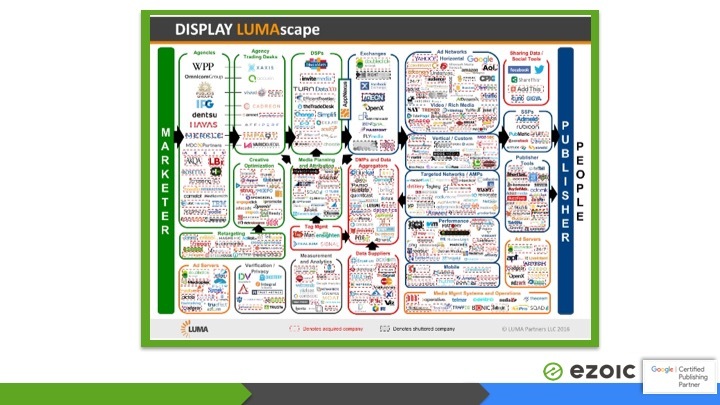 However, the advertising technology (adtech) space is extremely complex and can be difficult to understand. The intention of this is to break down exactly how web-based adverting works and to uncover the things that site owners and publishers can actually do to make more money without sacrificing their sites integrity. In the text below I will show you how internet-based advertising and online ads generate website ad revenue, and why the adtech space is so complex and often dangerous for publishers. I’ll further explain all the variables you can actually control to make money using ads on your site. If you have a website or are a site owner, I promise there is information below that will probably be new to you. Ads basically work like this, there are advertisers and there are publishers. Advertisers want to reach their desired audience as efficiently and as cleverly as possible. There are millions of advertisers. Publishers want to fund their publication and use ads to monetize their content and fund their overhead — much in the same way magazines used to sell ads in their magazines to support their costs. There are millions of publishers. Everyone from the New York Times to part-time bloggers can be considered digital publishers. In the purist world imaginable, advertisers would directly display ads on the pages of publishers who offer them the best opportunity to reach their audience. In turn, good publishers would want to ensure that advertisers paid them a fair price for their ad space. There are really three ways that ad inventory is priced: by impression, by click, and in some rare instances, a flat-rate; as a result of a direct deal with the publisher. The first two are by far the most common. Note: When we start getting into the weeds, we can talk about how campaign performance, viewability, and other ad attributes can affect publisher ad rate prices and ultimately affect buying costs for advertisers as well. For the sake of simplicity, we can ignore that for now. In this very pure, over-simplified world, advertisers would pay publishers different amounts for impressions and clicks for ad inventory on their pages (space for ads); based on the value of that space to the advertiser. This value to the advertiser is solely determined by the audience that the publisher has attracted. This is why content engagement affects the ad rates publishers are paid for display ads. Advertisers then reach their audience, and publishers fund their content via website ad revenue. A perfect relationship. However, as you already know, in practice it is much more complex than this — and in the last decade — it has gotten exponentially more convoluted and hard to explain. As we all probably know, the internet advertising business has a very large gap between publishers and advertisers. This gap exists because both advertisers and publishers want to be sure to extract the maximum amount of value from their relationship. Online advertisers want to display ads as effectively — and as cost effective as possible — and publishers want to sell their inventory (space) for the highest online advertising rates they can without annoying their users and disturbing those users experiences. This is where adtech comes into the fold. It is that gap. The image above is actually a simplification of this industry. This is a conservative version of the adtech space that exists between internet advertisers and online publishers (or site owners). Adtech — in all of its forms — is essentially trying to help one party — or both — achieve their ultimate goal. Because of innovation in adtech, internet advertising has gotten better for both advertisers and publishers in the past decade. Publishers have been able to better ensure they are earning the correct amount website ad revenue and advertisers have been able to ensure they are reaching their audiences effectively. However, because this space is so packed full of various parties (all with self-interests as well) it can be really difficult to understand which parties are truly adding value. The truth is some adtech businesses are adding a lot of value, some are adding little value, a few are adding a minuscule amount of value, and some are probably not adding any value. When you take a truly sober look at everything, all adtech effects other adtech, so because of the complexity in the space, there are likely some parties in the mix that are detracting on the value that others actually deliver to both advertisers and publishers. What does this mean? It means that because of the complexity in the space, most advertisers and publishers don’t really know who’s helping them and who’s hurting them in this whole equation. The Guardian is a very popular and forward-thinking online publisher. Recently, they decided to conduct an unprecedented experiment. They decided to buy all of their own ad inventory and monitor where all of their money went. We’re assuming they did this to better understand this space and position themselves accordingly. What they learned in their experiment was stunning. The Guardian learned that — in the worst cases — that they were only getting 30% of their spend back as a publisher. They rightfully asked, where did this other 70% of the money go? 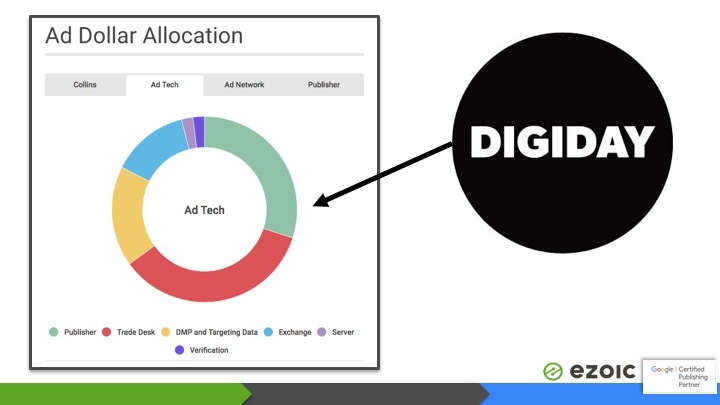 This missing 70% is the dark, scary side of adtech. As you can see above, Digiday did a nice write-up trying to explain and understand where this money went. While the above is only a guess, it is interesting that 70% went to all of these other sources with only 30% going to the publisher (again, in the worst cases). The Guardian claims to have learned a lot from this experience — and they should be praised for taking such a deep and creative dive into the subject — but the adtech industry hasn’t been thrilled by it. 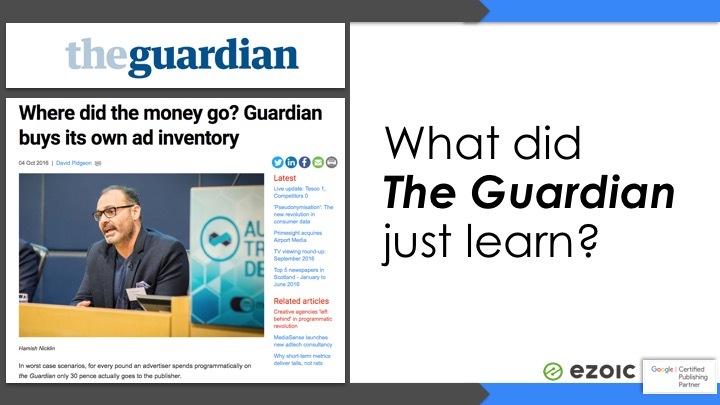 Many have called for The Guardian to share more information (why would they? ), but it’s unlikely they will. Ultimately, understanding this piece of adtech is important because it further emphasizes a very important point for publishers. There are things you can control and things you can’t. Adtech is a part of this space and it is providing value; however, more is not always better. Many publishers spend too much time in this area when they should really be focusing on the proven things that can actually help them make more money without annoying their users. There are really four essential things on your site that you — as a publisher — can control to make more money and ensure that you’re moving the needle in the right direction. Some of these may seem simple, but they are most sure approaches to assured future success. How to increase the value of your ad inventory. Your inventory is the ad space or placements that you have available to sell. You control this. The 100% best way to control this and to ensure that you are maximizing and optimizing this to its fullest potential is by testing hundreds of placements, sizes, etc. for all of your individual users. This is the only way to maximize your returns; while taking into account things like bounce rate and pageviews per visit. This is a daunting task. Luckily, there is a free tool that does all for this for you. Study on what improve website engagement for visitors. This is where most publishers should really be spending the majority of their time. Internet ads, technology, and the entire digital ecosystem will always have trends and changes. Content has had the same rules since day one. Make great content and people will read it, share it, and keep coming back. Having great content is like a restaurant having great food. People will eventually find out about it and tell their friends. The UX metrics that have the biggest impact on revenue and traffic for publishers. Many publishers rightfully worry about ads affecting their user’s experience on their site. After all, most publishers spend a lot of time designing pretty, elegant buildouts of their site designed to keep their users engaged. Ads can affect user experience, and it’s very important to take that into account when displaying ads; however, it is extremely important to use data to make these decisions. Too many publishers wrongfully assume certain types of ads will annoy users when the data doesn’t support it. The best thing you can do is test this too. As discussed above, some adtech is providing a lot of value and some may actually be detracting from your earnings. Be selective about what kind of adtech is on your site and avoid taking an “all adtech is adding value” approach. 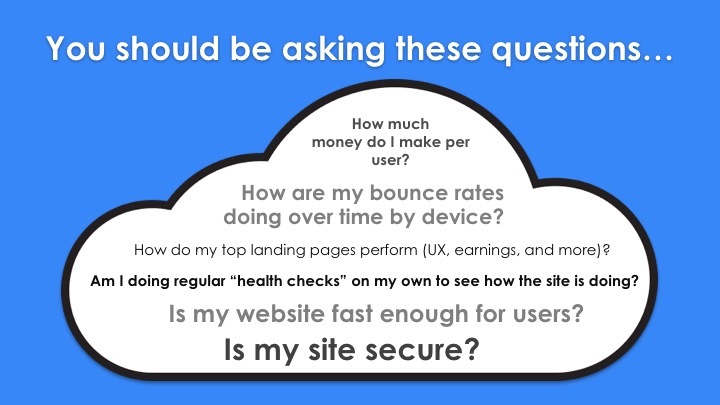 Finally, if you’re a publisher, the question’s in the image above are really the things you should be asking yourself about internet ads on your site. The answers to these questions are things you can directly control. 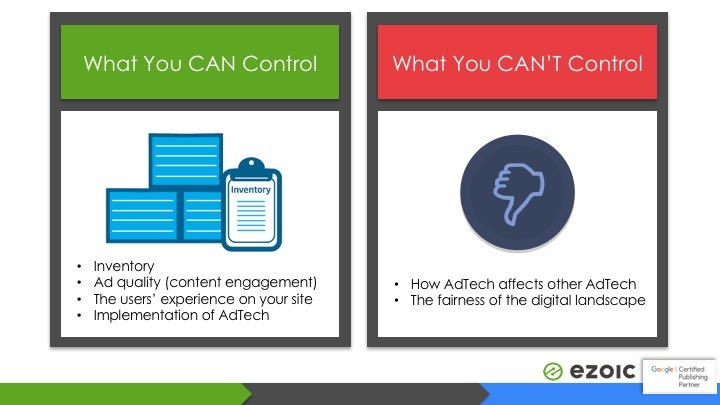 Many aspects of adtech are outside your ability to change. But, the good news is that few publishers are actually maximizing everything can currently do to make more money. Ultimately, moving in the right direction means that you are improving site revenue from internet ads and increasing visitors that come to your site. Don’t ever be fooled into thinking that one without the other is progress, it rarely is. Hopefully, this article has helped you better navigate this space.